In this thesis the features of rheological behavior of ultrasonic-activated water dispersions of montmorillonite in the presence of surfactants of anionic and non-ionic type are considered. It was determined that the strength of coagulation structure changes depending on the type of surfactant. Onikata M., Kondo M. and Yamanaka S.: Clays and Clay Minerals, 1999, 47, 678. Introzzi L., Blomfeldt T. et al. : Langmuir, 2012, 28, 11206. Osipov V., Sokolov V. and Rumjanceva N.: Microstructura Glinistykh Porod. Nedra, Moskwa 1989. Park H.-M., Kim T.-W., Hwang S.-J. and Choy J.-H.: Bull. Korean Chem. Soc., 2006, 27, 1323. Tombácz E. and Szekeres M.: Appl. Clay Sci., 2004, 27, 75. Hower W.: Clays and Clay Minerals, 1970, 18, 97. Permien T. and Lagaly G.: Clays and Clay Minerals, 1995, 43, 229. Auerbach S., Carrado K. and Dutta P.: Handbook of Layered Materials. Marcel Dekker, New York 2004. He H., Zhu J., Yuan P. et al. : Proceed. ICAM 2008 – Ninth International Congress for Applied Mineralogy, Brisbane 2008, 321. Wang C., Juang L., Lee C. et al. : J. Colloid Interface Sci., 2004, 280, 27. Chen D., Zhu J., Yuan P. et al. : J. 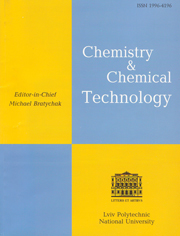 Thermal Analysis & Calorimetry, 2008, 94, 841. Armando G., de la Torre L, García-Serrano L. and Aguilar-Elguézabal A.: J. Colloid Interface Sci., 2004, 274, 550.